Thirlestane, one of the oldest and finest castles in Scotland is set in lovely Border hills at Lauder, 28 miles south of Edinburgh and 68 miles north of Newcastle, on the A68. Built originally as a defensive fort in the 13th century it was re-built in the 16th century as the home of the Maitlands. As the seat of the Earls and Duke of Lauderdale it was enlarged and embellished over the centuries but it still remains home to the Maitland family - the Duke's ghost is said to haunt the castle. See the Panelled Room and the library with their defensive walls up to 13' thick. Absorb the atmosphere of the Billiard Room with its fascinating salmon fly screen. Climb the ancient turnpike stair to the Duke's Suite, including the incomparable 17th century plasterwork ceilings. Relish the splendour of the Green Drawing Room and the Ante Drawing Room with their exquisite ceilings and joinery. Meet the Maitlands through the portrait collection in the State Dining Room and discover some of their fascinating treasures. Sink into nostalgia as you enter the Family Nurseries with their unique collection of historic toys. Some are in replica form for children to use and dipping into the dressing up chest can create some memorable moments on a family holiday. Discover the old Kitchens and Laundries, and explore the Border Country Life exhibitions showing domestic, sporting and agricultural life over centuries. 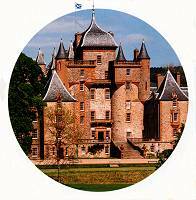 There is much more to see at Thirlestane than in many historic homes so please allow plenty of time for your visit. The Castle is closed in 2013 owing to remedial works. The grounds will be open as usual, for which parking charges will apply. On A68 Edinburgh to Carlisle road at Lauder.